All refractory material has a lifespan. 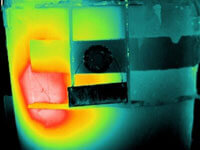 When a refractory material is replaced, usually a profile of the old material will be taken to assess its performance. This profile will help those in charge to determine the best course of action for installing the replacement material. Armed with this knowledge, the decision may be made to change to a thicker/thinner material, a material with a different composition, or zoning the materials to combat the wear patterns that were observed during the profiling process. 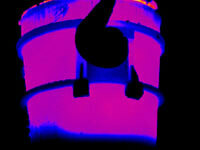 Now let’s take a look at how thermography can help us make some of these decisions on the fly and keep all employees and contractors working in the areas around these refractory lined vessels, pipes, etc. as safe as possible while doing so. The goal is to achieve maximum use from the refractory material during each campaign. This will help to minimize conversion costs and maximize profits. Having the ability to monitor the condition of the refractory material with a method far more advanced than just a visual examination can prove to be a very wise alternative. The ability to see changes in the thermal patterns across the surface of the outside shell of the vessel can equip you with the information needed to make the difficult decisions regarding refractory life while always focusing on the safety of all involved. Refractory failures (washouts) can be very expensive. Assuming no one is injured during the incident; the costs involved include loss of material, downtime, cleanup expenses, idle manpower and possibly missed shipping deadlines. All of those costs are a drop in the bucket if someone is injured, or worse, during one of the incidents. Seagate Consulting Services is staffed with highly trained Level III Certified Infrared Thermographers equipped with high-resolution imagers to allow for a comprehensive inspection that will lead to a detailed report of any and all exceptions.